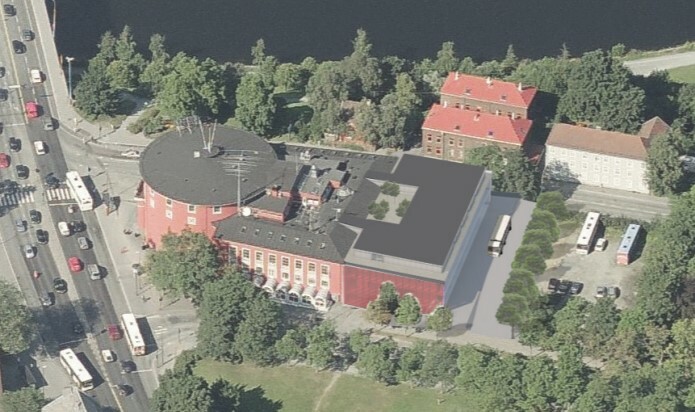 ARK artist rendering of new antenna on an extended roof towards Fengselstomta. On Thursday 20.09.18 the drafts from the architectural competition for an extension of Samfundet were made public. Currently, this is one of the most discussed matters in the student community (1, 2, 3), and we feel that it would be both funny and useful to shed some light on the matter from ARK’s perspective. While many people have many opinions on how the building should appear in the future, we humbly assume that we are the only ones who are interested from a radio technical perspective. The roof has been ARKs natural breeding ground for nearly a century, and this is where we concoct both crazy and cool new antennas, so it is only natural that we are excited about how it may expand in the future. Note that the entries are not credited at this time, this is due to the entrants having secret identities until they are unveiled later this week. This post will be updated with the proper credits at that time. The full entries may be found on this link. 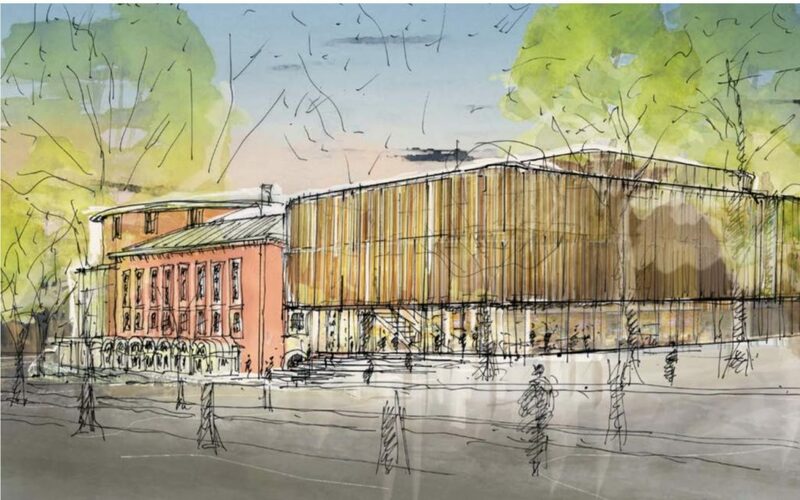 The competition is mostly concerned with Samfundet’s exterior shell. This suits us perfectly, as this is where most of the radio impact would come from. Since this is a competition we also need some performance metrics! Du store verden presents a ~rectangular solution (atleast by Samfundet standards) with a flat roof that extends one floor above the current lower roof. Near the centre of the proposed structure is a light well. When considering existing antennas, it is a little concerning that the new building will exceed the height of the existing structure, this is probably easy to work around – but could cause some issues for example for our 3 m parabolic dish. The central light well interrupts the otherwise perfect ground plane atop the new structure. Because of these factors the structure scores 7/10 in our radio performance category. The suggested roof is flat, which should make it easy to work with different projects, but the access seems a little limited. Possibly a ladder could be erected on the causeway between the old and new building. On practicality “Du store verden” scores a 6/10. 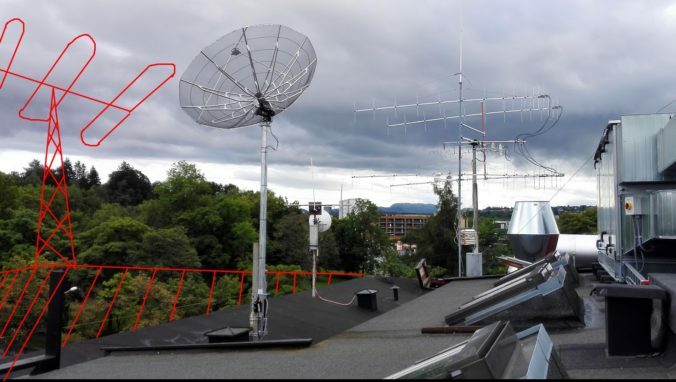 The candidate almost perfectly extends the area that new antennas might be placed in, however the insertion of a glass structure between the two buildings, and the elevation difference between roofs means that some space is lost – ending it at 7/10 points for future antennas. Candidate number 1 suffers a fall in starting position by getting a 0/10 in our bonus points category, the design bureau managed to edit out our antennas from every single picture in the presentation, boo! Similarly to the previous entrant, “Sceneskifte” adds a second building separated by glass joinery between old and new building. It has some important distinctions from ARKs perspective though, as there are no natural causeways across the glass joinery. It scores 3/10 for practicality as this might prove very troublesome in deploying new antennas, and other roof activity. The other challenging feature is the slightly smaller rectangle placed on top of the main rectangle. This makes for a more segmented ground plane, and reduces the general space for working with larger antennas. The benefit is that it would be easier to expand with more masts in the future, by bolting them to the existing wall. For these reasons it scores 6/10 for radio performance, and 7/10 for room for new antennas. “Sceneskifte” also lands a solid 0 points in our bonus points category by editing out all our antennas, grr! As the only competitor that did not edit out our antennas in all the pictures, “Merry Glow Red” gets 2/10 points in our bonus points category (they did still edit them out in most of the pictures 🙁 ). Originally we wanted to allocate 4/10 points, but had to deduct 2 points due to their suggestion of adding solar cells, which are infamously noisy on HF. The roof is almost seamlessly extended from the current roof, allowing for an immense amount of potential antenna space. 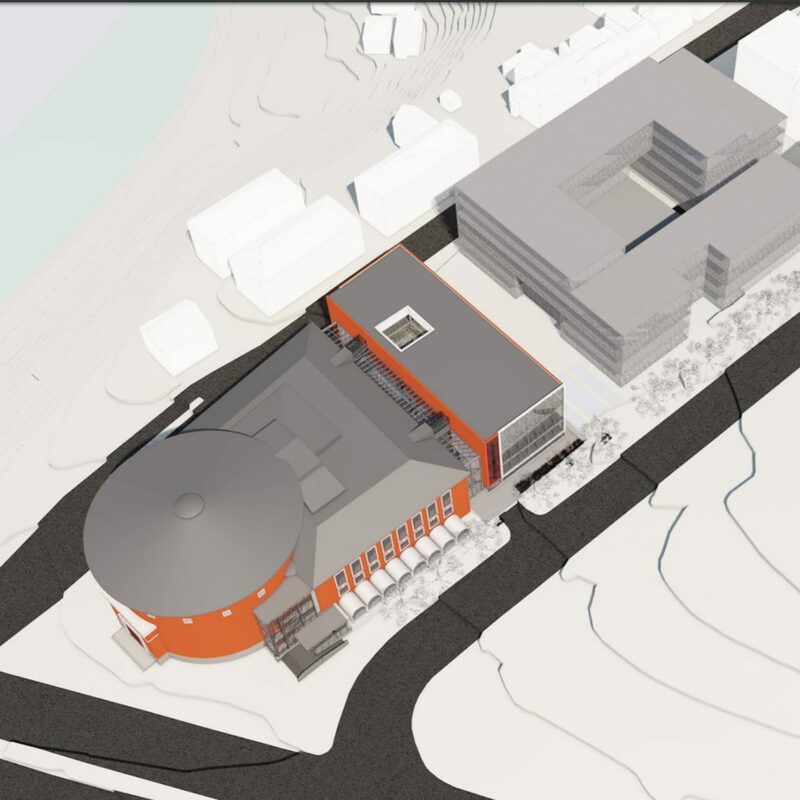 Hopefully the budgets will be too tight to include the proposed roof garden – leaving us with a large perfectly flat roof. This flat roof scores very well on radio performance with a 9/10, with potential a bump to 10/10 if the roof garden is scratched. The immense space combined with the slight rim around the upper structure allows for many different antennas and masts to be erected. The future antenna score ends at 8/10. With a practicality score of 8/10 due to the flat and easy accessible roof, “Merry Glow Red” comes out on top of our internal competition – we’ll be rooting for it!